A young girl named Suzu who, in 1944, moves from neighbouring Hiroshima to the port city of Kure, the largest military base for the Imperial Navy and home to ships like the Yamamoto. She moves there to marry Shūsaku, a young clerk from the local naval base. The rest of her new family is her father in law Entarō, an engineer for the Navy, her mother in law San. Eventually her sister in law Keiko and her daughter Harumi join the family. When the Americans are within striking distance of the mainland they launch deadly bombing runs on the key military target of Kure. Through tough wartime conditions - rations, food shortages and limited supplies - Suzu cooks and cares for her new family. At the end of the war Suzu’s life is shattered but through perseverance and courage she manages to continue to live life. 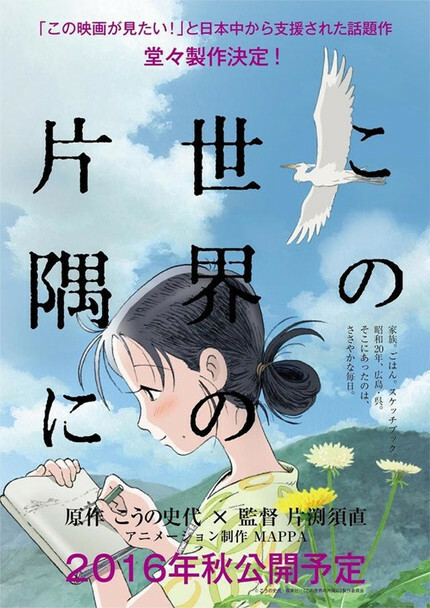 In This Corner of the World is based on Fumiyo Kono’s award-winning manga. This equally lauded and award-winning animated version of the story is a startling perspective of the Japanese people and their life during a time of war. On one hand it is a historical story that shows the resilience at the civilian level drawing from real life accounts. As the story goes along the dates are periodically noted. This creates a growing dread as the calendar counts down towards August 6th. One the other hand the domestic story is of a young woman who marries into, more or less, a stranger’s family and does her best to fit in. Director Katabuchi Sunao never exploit the tragedies that beset the characters of his story. They never happen in front of the camera, rather, we see their impact. More often than not they are delivered with such subtlety and grace you may miss some of them. Others, ring through your head like the sound of the klaxons warning of an impending air raid. One particular moment, once the bombing campaign by the U.S. begins, draws attention to their strategy and the kind of weapons the U.S. used. But this one particular moment ends so tragically, if you’ve never thought of the civilian populace on the other side of any conflict it is terrifying and eye-opening. I believe the animation style, some may call it simplistic or basic, compliments the rustic and rural setting of the story. The story is about everyday people making the most out of their circumstances during a period of war. Either by choice or by necessity, being a crowdfunded animated film with a small budget, the character designs are simplistic and there is not a lot of gloss to the production. Yet it is still rich in detail and some of the scenes still manage to take your breath away. Even at the animated level the Japanese are still unparalleled when it comes to something so simple as portraying food preparation. I predict that In This Corner of the World will become an excellent companion film to Takahata Isao’s Grave of the Fireflies, as one story easily leads into the next. Though the story of In This Corner of the World is not as tear inducing as Grave of the Fireflies it is very much the precursor to that tale. One tells of a time leading up to the end of the war, the other follows the terrible fallout and aftermath. In This Corner of the World is an important addition to the story of all of the nations who were thrust into the global conflict of the Second World War and offers a perspective that many outside of Japan would have never thought of. For the Japanese people I imagine it reminded them of a time when their resilience and personal strengths were called upon at a time of great need. So so done with Japanese films revolving around the war. Especially the ones soaked with saccharine sweetness and overt sentimentality. Really, enough.